At less than half the weight of other compressor kits, this system is ideal for competition vehicles, rock crawlers, or any other vehicle where a compact, light weight, and quick installing design is needed! The compressor features fully sealed components, pressure switch controlled air manifold system, hard anodized cylinder bore with carbon fiber piston rings, relocatable air filter assembly, ball bearing equipped rotating components, and the low current draw of 5 amps at no load and 6.5 amps at full load means it will run on the 12 volt accessory supply of most 12 volt and 24 volt vehicles. 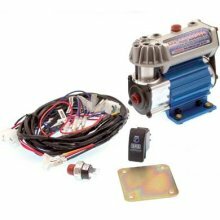 Kit includes fully assembled and tested 12 volt compressor, complete wiring loom with air locker solenoid plug-in contacts, switches, air filter, mounting hardware, and comprehensive photo-illustrated installation guide.